When it comes to grab an image on your scree all you really need is an easy, efficient capturing tool that enables you to do the job in almost no time. And if it also features some nice effects and filters, what else could you ask for? This is what you get with EasyCapture: a handy capturing utility that includes all the tools you need to capture anything on your screen, from a tiny user-defined area to the whole desktop. You can use hotkeys for capturing and also open as many images as you want on the program's tabbed interface. Plus it includes some basic effects that you can easily apply on your photos. They may not be as powerful as Photoshop's filters, but they'll do the trick. But what I specially like about EasyCapture is the ability to add clipart to the images. You can highlight text with a virtual marker, use rectangular shapes and arrows to draw attention to certain elements in the captured image, insert text fields and also fun text balloons to add annotations. Each one of these tools has its own settings to configure size, color and other elements. EasyCapture has some flaws, that's true. For instance, the scrolling window capture mode didn't really work (it didn't scroll the window completely). Also, the Text tool doesn't show up changes in real time when you're editing the text, which is kind of annoying. But in general terms I found this to be an excellent capturing tool for an unbeatable price. Capture anything on your screen and edit it with filters, effects and some fun clipart. 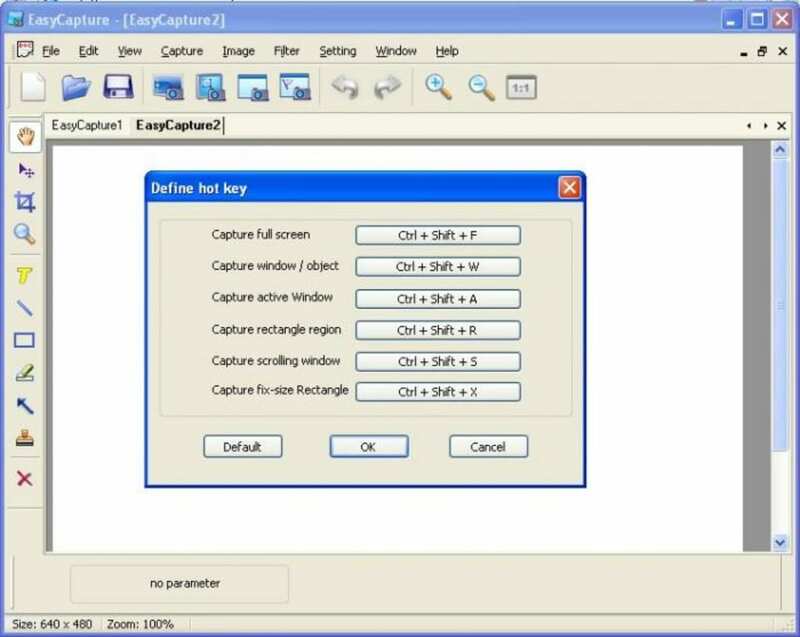 EasyCapture is a powerful, flexible and easy-to-use free screen capture software. 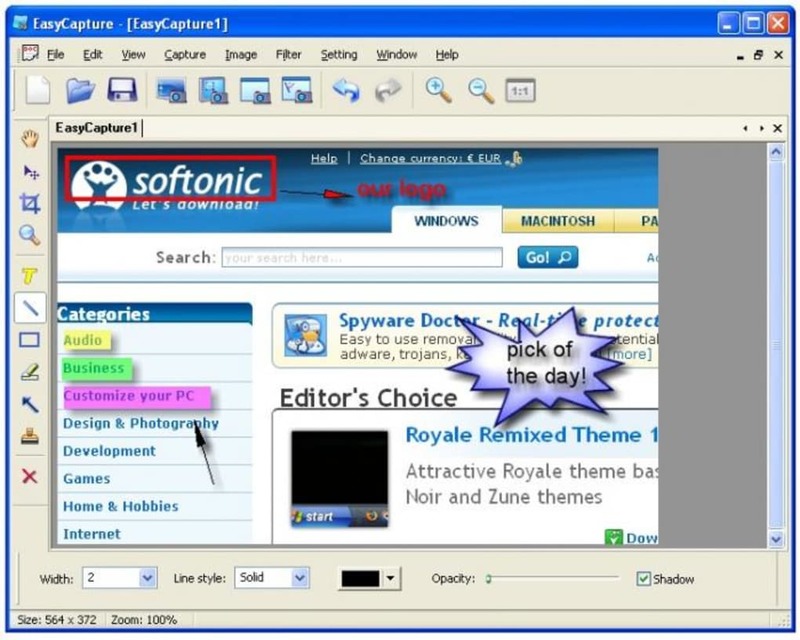 It allows you to capture anything on the screen including windows, objects, full screen, rectangle-selected regions, fix size regions, and scrolling windows/web pages. It also allow you to edit captured image and add annotate. enjoy it! You'll be able to capture your screen in many different ways: Region Capture, Capture Screen Window / Object, Full screen capture, Active window capture, Scrolling window capture, Fix rectangle region capture. If the color or size of your original capture isn't quite right, you can make adjustments easily in Cessna. With features like crop, resize, brightness, contrast, color level, color tone. 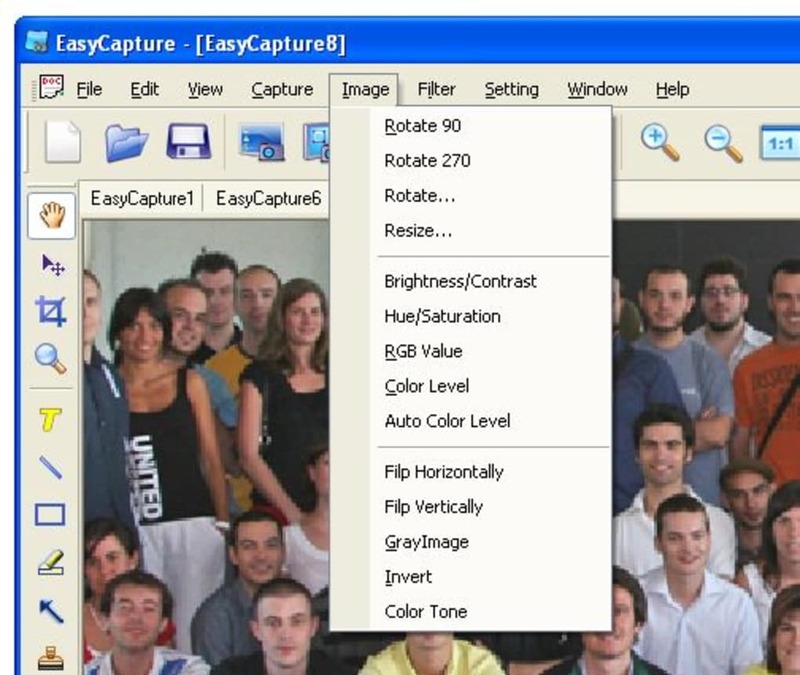 EasyCapture lets you add special professional effects with Flip, invert, Hue or saturation and Image processing effects, like blur, emboss, oil paint, halftone, Mosaic and 3D grid. Add text annotations, lines and arrows, highlight certain areas, add stamps with text balloons, draw rectangular marking areas... all with their own settings. EasyCapture lets you easily output each capture to clipboard or save it to image file, including BMP, GIF, JPEG and PNG format. If fixed can be great. The version 1.2.0 has potential but the 2 main functionalities don't work properly. Pros: You can manage a lot of pictures. The scrolling feature doesn't work. The region feature is not usable with the touchpad. When ever you stop resizing the picture is taken. This is an easy fix for the developers. This will create a better 3D look to my images.. Just downloaded it looks like I'll be able upload images from my FireShot or Snagit easy enough. Great Job . Thanks. Great Program. Easy Capture's the cats meow. Works great and has lots of flexibility. One of the best freeware programs I've seen in a long time. Works great on Win 7 64. Easy screen captures. Has nice cropping tool too.